Back in 2014 I started riding in Baja on my KLR and a KTM 350 EXC, but I didn’t have adventure boots. After my second dual-sport ride my poor little Tour Master street boots were trashed. My friend’s motocross boots fit okay, but they were too heavy and noisy to walk in. It was clearly time to go shopping. Looking through the crop of serious four-season, full-height, dual-sport adventure-touring boots, I saw, with some dismay, that boots with the features I was looking for ranged from $350 to $550 in price. Serious consideration would be necessary and, being the travel gear geek that I am, I investigated all the possibilities, documented my findings, and presented them here for you. After a couple of months grilling the adventure riding community about their choices back in 2014, I decided on the TCX Infinity GTX (Gortex) adventure touring boots, formerly branded Oxtar. I loved them! By now they’ve had a lot of hours off-road and on and are beat up pretty bad after being mistreated in the Anza-Borrego and Baja deserts and some serious off-road adventures in the Carson Valley-Lake Tahoe area. 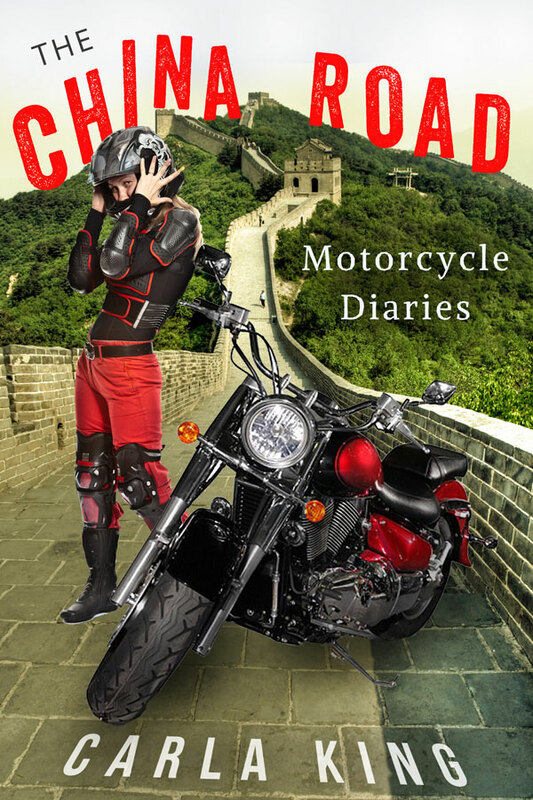 I have dragged them through sand, rocks, and water crossings, mud, gravel, high grass, underbrush, and cacti, and even melted a little bit of the sole on the pipes of the Ural sidecar motorcycle. They’re still holding up so I left them and some other battered gear with my KTM 450 EXC in a Baja garage. When I went looking again for boots I discovered that the TCX Infinity has been completely redesigned. I tried them on with no luck. The redesign did not fit my feet! So now I started my search all over again. This time I was better prepared but still, there was a lot of new information to digest: new entries in the marketplace, new kinds of buckles, soles, and straps. I had been attracted to the Forma Adventure for a while and bought them because they were on mega sale at a local BMW shop. But I think I would have also been happy with the Gaerne Balanced Oiled or the Alpinestars Tech 7 Enduros. THIS POST IS IN BETA – A WORK IN PROGRESS. THANKS FOP YOUR COMMENTS AND SUGGESTIONS IN THE COMMENTS SECTION BELOW. There are five companies that dominate dual-sport adventure motorcycling boots. I want to share my dual-sport adventure motorcycle boot shopping journey with you in hopes that it will help you find a pair you’ll love. Thank you to everyone on Facebook who put their 2 cents in. It helped a lot in updating this review. 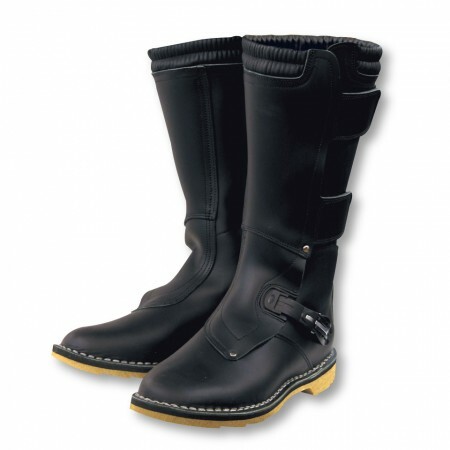 These boots are the most popular among my well-traveled adventure motorcycling friends. I wear a size 8-9 women’s which means I can fit into the smallest men’s boots. This is lucky because the industry has yet to make adventure boots in women’s sizes. I’ve noted options for women with smaller feet as well. I collected the boots into lookalike groups (see photo below, click to enlarge) because I think most of us have an idea of the “look” we want. Simple or complex, sleek or clunky, old school or hi-tech, black or brown, understated or colorful. I hope that the review of the boots I chose in combination with my shopping experience and this pictorial comparison of boots with prices will help you choose the right pair. I’d love to hear your thoughts, your concerns, frustrations, compromises, and your experience with boots of your past, present, and future. Did I leave your favorite boots out? Do you agree or disagree with my impressions? I know this is a hot topic, so I look forward to hearing from you in the comments area at the end of this article or via the contact form on my website or join the discussion on my Facebook page. Let me first state that I can wear men’s sizes because I have a wider foot than the average woman. Luckily for me, most boots start at European size 40, which is a woman’s size 9. The TCX starts in size 38. However, most stores stock size 42 and up. If those are too big, the stores can order them from the factory. Plan ahead, because this can take six weeks or more. My size 40 with a cushy sole insert fits great. I put them on and forgot about them, and that’s the best recommendation I can give for any piece of gear. As I mentioned in my review of the Schuberth C3 modular helmet, the best gear both protects you from a possible mishap and provides enough comfort to forget about it and enjoy the ride. The pickings for women in the dual-sport and adventure category are slim. All I could find were SIDI’s race boot the Vertigo Lei and their Fusion Lei sport boot, both of which are shorter than the average dual-sport boot. As a side note, I hope that the industry catches on to the numbers of women who want boots in this category. The number of women who attend adventure motorcycle events like Overland Expo and Horizons Unlimited is approaching fifty percent and we’re all wearing boots designed for men’s feet. The TCX Infinity has all the features I was looking for: Reinforced heel and toe cockpits, stiff ankle area with malleolus protection on both sides, sturdy footbed and sticky sole, shin protection, reinforced toe and heel cockpits, rubberized shift guard, two cam-lock buckles, thermal heat-resistant suede on the inside of the shin, a velcro closure, and a Gore-tex fly or gaiter. All TCX boots are made with an anatomic, replaceable footbed that is manually fitted around a foot-shaped mold. There is no break-in period, and the boot flexes easily at the front and back of the heel. This means walking is comfortable, though the footbed is stiff enough that you wouldn’t want to trek more than about a mile without a break. It’s stiff enough to stand on the footpegs for hours but, unlike many of the stiffer MX boots, you can still feel the pegs under your feet. The sole is patterned in a sticky black tire-tread pattern that channels water out to the edges so you don’t slip in water and mud. The boot feels custom-fitted with its combination of adjustable cam-lock buckles, the wide velcro closure, and the padded elastic collar. It fits snugly with your pants in or out of the boot, or even with a motocross knee and shin guard tucked inside. A couple of inches of Gore-tex on the inside at the top of the boot keeps the foot cool and dry. In the past few months I’ve ridden in both very hot and very cold conditions, through water crossings and across desert sands, and on miles and miles of tarmac, with no discomfort at all. I thoroughly tested the safety features of the Infinitys at the Carson Valley / Tahoe Adventure Motorcycle Rendezvous in August. The first ride was a challenging day along the boulder fields and shale trails far into the hills and valleys. I opted for the “medium-level” off-road instead of “beginner,” but it turned out to be a rather advanced run. Still, I made it, after bouncing off a few times (at slow speeds). This amused most, but irritated a few, of my fellow riders. And they were all fellows, making it all the more embarrassing for the sole woman in the group, even after one rider was trucked out after a collarbone-breaking fall 18 miles into the hills. Because someone else rode my bike down a particularly steep descent, I can also attest to their comfort while picking your way down a rocky trail. Yeah, yeah, I see the boulder. Now where’s my bike? After four years in adventure boots, I feel naked in street boots. Today’s touring boots have so much protection embedded into a not unstylish product that I don’t find it necessary to choose. In comparison, the street boots, though they’re safety conscious in their class, seem much too short and flimsy. Perhaps if I had chosen one of the more clunky models made with a lot of TPU (Thermoplastic polyurethane) like the SIDI Rains ($350-$400), Alpinestars Toucan ($449), or TCX’s X-Desert ($399) I wouldn’t be as willing to wear them for a spin on my Guzzi cruiser. But a lot of the adventure touring boots are good-looking enough to pass for cruiser wear. I choose adventure boots over my street boots when I cruise on my Guzzi. Because shopping for gear is such a journey, I’d like to share it with you, explaining why I eliminated the contenders from my list. I’m going to start with the Combat Touring boots ($367) made by SIDI for Aerostich, which are a very popular boot with the adventure riding crowd. People love their Combats but there are several reasons I ruled them out. First, though they’re padded, they are the only model that does not have a reinforced shin guard and hit my shins on the pegs as well as underbrush an awful lot when I’m riding off-road. So the Combat seemed to me to target the dual-sport rider who rides the occasional fire road, unlike most of the others in this quality/price point, which offer true off-road protection in the single-track class. Another factor that determined that this boot was not for me had to do with the fact that it’s made entirely of untreated leather. It’s incredibly heavy, stiff, and difficult to walk in until a very long and painful (according to many reviewers) break-in period. I think there are two camps when it comes to boots: high-tech and old style. I love sloshing through puddles and mud and being able to just hose them down and forget them between rides. I’m not crazy about the constant maintenance involved in keeping leather soft and waterproof. The Combat is fastened by a single buckle at the ankle which, in comparison to the other boots, seems unusually stingy for a boot in this class. Many reviewers report that the dual velcro fasteners wear out, too. I wonder why they don’t add a second buckle, like most everyone else, with a single velcro fastener at the top? On the Combat, adjustment depends upon a lace-up cord between the outer and the gaiter that looked to me to be fumbly and futzy. Indeed, reviews commonly state that the laces stick to the velcro closure, which eventually frays them into oblivion. In the end, two factors killed the Combats for me: Lack of safety features and the leather material. Leather requires a long break-in period and constant maintenance. Not to mention the lack of a breathable Gore-tex lining. The Combat is a 100% old-school boot with a lovely retro look. Enjoy, luddites! When I put the word out on Facebook that I was shopping for adventure touring boots, I received more recommendation for Gaernes than any other brand. I’d already ruled them out for many of the same reasons I ruled out Aerostich’s Combats, but wow, do they ever have a wildly dedicated fan base. The consensus is that the break-in period is almost non-existent, they’re lighter, extremely comfortable, and they’re brown, not black. I wouldn’t mention this except that so many men point out the rugged mountain-man look of them. “The kind of boot Steve McQueen would wear,” was one review. This glimpse into male vanity gave me a little laugh, but I understood. They do have a “rock-star adventure rider” vibe about them, and I’ll bet they look great with one of those workmen’s kilts. Gaerne’s Balance Oiled boots ($356) are pre-oiled and fully waterproof right out of the box. They claim that oil-tanned leather is more breathable than the PU (polyurethane) coated leather that “modern” boots use, and the “Aquatech” membrane inside keeps your feet totally dry. Originally created for trial riders (hence the name “Balance”), this model has hard inserts in the heel and toe but no reinforcement in the ankle. This means they are a bit too bendy for someone in the habit of putting herself at risk of frequent dual-sport get-offs. However, the leather is much thicker than street-boot leather and, in combination with the interior padding, gives you a fair amount of cushion. Like most of the modern, high-tech boots I looked at, the Balance Oiled do have three buckles and a shin guard. Resellers tout it as the most comfortable boot they’ve ever worn, claiming a five-mile hike is not a problem. Gaerne also uses a modified MX boot midsole that’s reportedly stiff enough to protect against folding when striking a hard object, but flexible enough to feel your footpegs. I must admit that the combination of old and new school features tempted me, even in spite of my logo-itis — they put a big white G across the front. What to do? Probably just have a go at it with my fat black Sharpie. Sizes start at an American 8, but smaller sizes are available by special order for about $40 more. 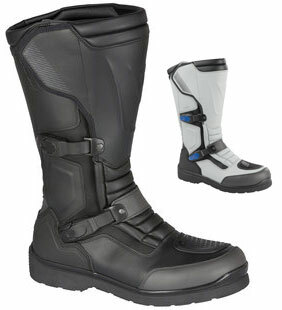 A budget version of this boot is the Gaerne Pro-Tech ($284) which is not waterproof. The new TCX Infinity EVO Gore-Tex boots replace the old Infinity GTX model that I own. This boot is classified by the company as a “touring adventure” model. It fit my requirements for a dual-sport adventure touring boot crafted from waterproof yet breathable material. The old model had an elastic collar at the top to keep out water and debris but the new model does not. Other than that, the new model is improved in many ways. I also liked their understated look in comparison to the clunkier (and more protective) models I looked at and the new model has a similar style as you can see. Check out Anthony’s video review of this boot with a rundown of the changes. Such are the consequences of timing that if Forma had been on my radar when I was shopping for boots, this review may have featured their Forma Adventure boot ($299), with the TCX Infinity description placed about here. Forma is very popular in Europe and Australia but virtually unknown in the USA because they didn’t have a US distributor until recently. You can buy them now at Atomic Moto. Like the Gaerne, the Forma Adventure is made from beautiful pre-oiled leather and it comes in brown or black. Plus, it has all the hi-tech features of the TCX and others in this roundup: adjustable buckles, a shin plate, and sturdy heel and toe compartments. It’s a beautiful combination of old school and new tech and I definitely want to try it on. The Drytex liner in Forma boots is, like Gore-tex, completely waterproof and breathable. It has great ankle support with molded inserts on the inner and outer ankle. So it’s rigid and supportive but built for comfort. In fact, it’s more flexible at the toe than other adventure boots, and fans say it feels much more like a hiking boot. This really attracts me because I, like a lot of adventure touring folks, like to spend a significant time off the bike to explore, whether it’s a short hike in a state park or a trek through a new town. Retailers stock sizes starting at 42 but you can special order sizes 38-41. And for you Steve McQueen types, yep, it also comes in brown. The only downside for me is that the Formas, like the Gaernes, Alpinestars and one of the SIDI models, suffers from logo-itis. Honestly, I’d pay more for a version without logos. For $20 less you might consider the Forma Boulder ($279), which does not have waterproof, breathable lining, but the untreated breathable nubuck suede leather is naturally breathable. If you like the look of the TCX Infinity but it’s too expensive for your budget, take a look at Forma’s Cape Horn ($299) touring boot, which looks a lot like it, though it lacks the elastic collar and the same level of heel and toe reinforcements. I have a few friends who have invested in SIDI Adventure Gore-tex ($550) and swear that everyone else should wear them, too, even though they complain loudly about the squeak. In fact there’s an entire thread on “The SIDI Adventure Squeak” in ADVRider, with wearers recommending solutions from furniture polish to baby powder. The SIDI squeak is background music at any adventure motorcycle event, no apologies required. But with all the complaints on this defect I can’t imagine why SIDI hasn’t solved the problem, especially as their boots are among the most expensive in the bunch. If they don’t do something about it soon, I predict that all the other manufacturers will start to brag about their anti-squeak technology. I was tempted, but in the end, did not choose the Discovery Rain because of 1) the SIDI squeak and 2) logo-itis. I simply do not like wearing corporate logos. Logos on the more expensive Adventure Gore-tex and Adventure Rains are more subdued. The Discovery Rains have large white letters emblazoned across the front of the boot. To further complicate the shopping experience I discovered SIDI’s Armada Gortex ($400), a beefy and good looking waterproof “convertible” boot in black leather with Gore-tex lining. The outer dual-sport sleeve provides ankle and shin protection and, once removed, reveals a fully-finished, good-looking cruising boot. The Alpinestars Toucan ($449) is well-respected for their MX line. The Toucan is rich with safety features and it’s also an extremely lightweight boot at 2.12 lbs. You’d think that a boot of this weight would have greater flexibility but actually, they’re quite stiff, and they also lack the elastic collar around the top edge. Like the SIDIs, they were somewhat clunkier than I could live with. If you like this boot but can’t afford the $449 price tag, take a look at their Scout model at $249. Also, take note, the Alpinestars don’t squeak! The Alpinestars Corozal Adventure ($289) attracted me with it’s “adventure” look in brown and black and a price tag under $300. Designed for adventure riders it’s waterproof and claims to be comfortable to walk in. This is a fully redesigned mid-sized waterproof adventure boot is considered the baby brother to the Toucan and runs only $10 more than the Scout. Anthony at Revzilla says it gives Garne and Forma a run for their money. It’s got a walking sole but does not have a replaceable mid-section. For more off-road go with the Tech 7 or if you find yourself more of an on-road rider with some detours on the dirt take a look at the Toucan. Take a look at Anthony’s video review and decide for yourself. The Alpinestars Tech 7 Enduro ($369) comes in black or white with color splashes in yellow, orange, and blue and the orange/blue/white combo that I liked. I’m not usually attracted to colors on boots other than black or brown, but I like the earthy orange tone on this particular design. This is Alpinestar’s Tech 7 MX boot with its slick sole changed up to a grippy sole made for adventure and technical enduro and ATV riding. A new type of buckle-closure system uses high-impact aluminum bridge closures with memory settings and a quick-release locking system. Though it’s not waterproof a microfiber gaiter keeps dust, dirt, mud, and water from entering the footbed. 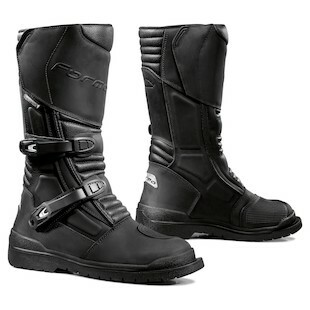 I don’t know anyone who wears the Dainese Carroarmato Gore-Tex boots ($369) but they’re gorgeous and very comfortable. I might have considered them except that I was by now committed to the idea of that elastic collar around the top of the boot. I would certainly recommend taking a look if you’re more street touring oriented than dirt. These boots are so good looking that you could wear them with normal clothing, and they also come in white with turquoise buckles. Now that’s Italian! The range of dual-sport or adventure boots is staggering, and this selection is as far as I got without getting completely overwhelmed. I know people who wear BMW’s dual-sport boots and they probably belong in this lineup, too, but they don’t advertise online and I didn’t get to the dealer. If you bought a BMW from a dealership, you may well have them, along with a lot of other branded BMW gear. What other boots did I leave out? Offerings from Europe – Wulfsports, for example, which a few of my British friends love. What boots do you love that I left out? I’d love to hear about them in the comments section at the end of this post. I’ll also continue the discussion on my Facebook page. Safety – What features can’t you live without? Mine included shin guards, heel and toe reinforcements, and ankle protection. Riding style – I ride mostly street and dirt roads, with enough technical trail riding to warrant seriously protective gear. And I aspire to ride more dirt. But if you ride mostly street with the occasional fire road you’ll need less protection than someone who rides to search for good single track. Price – Adventure touring boots are expensive, but even if you need to watch your budget you don’t need to sacrifice safety. There are plenty of options in the less expensive trials and MX boot categories to choose from. And don’t forget Craigslist, eBay, and check out the selection of used gear in my friend Jessica’s Yellow Devil Gear shop in Los Angeles. She ships! Despite lusting a bit over the Forma Adventures and the SIDI Armadas, I don’t regret choosing TCX Infinity. They’ve already proven themselves on long tarmac rides and single-track challenges. They’ve protected me from a fall in a boulder field, from a slide on shale, from water crossings and desert sands. I have forgotten that I’m wearing them for very long periods of time. Cleaning them requires a quick swipe with a sponge and the occasional touchup with black shoe polish. And they’re understated enough that I can get away with wearing them off the bike with tights and a skirt. In adventure motorcycle touring, less is more, so if I wear these and pack my flip-flops, well then, it looks like I’m ready for Baja. What boots do you wear for adventure touring? Join the discussion. Thanks for a wonderful break down on riding boots. It means a lot coming from a lady that rides all sorts of bikes and understands all types of riders. Much love sister!